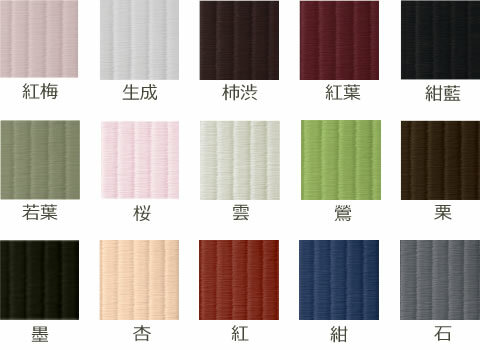 The surface of tatami weathering is made of acrylic urethane coat with less color change, excellent in waterproofness, chemical resistance, and abrasion. It is also used for dressing areas of hot springs and relaxation space. 15 colors are available so that you can link to various space creation from home to commercial facilities. Authority of tick medicine, Takashi Masatoshi medical doctor also recommends tatami daily weather. ※ product size is not a regular size value, there is a tolerance of ± 3 mm. Please pay attention to the construction method when involving construction. ※ Since thickness varies depending on type, please unify type when spreading. Acrylic urethane coat excellent in waterproofness, chemical resistance, abrasion resistance, and almost no color change. Rooftop floor · Parking material It is a material with proven track record on the floor. Urethane elastomer material which is resistant to tension and has elasticity. Comfortable cushioning property and excellent heat insulating properties. Urethane elastomer material with antiskid layer on the surface of the slip prevention layer . Honeycomb (beehive) shape lightweight and strongly bend resistant material.